Reid made the same mistake on December 24 when voting on the original health care bill, as shown below. The gaffe produced audible laughter in the chamber with someone saying “he did it again.” Here is the latest video. “Last weekend, as the House of Representatives gathered to debate health care reform while Tea Partiers protested outside the Capitol, word emerged that Rep. Emanuel Cleaver (D-Mo.) had been spit on by one of the demonstrators. Cleaver released a statement confirming the incident, but some questioned his claims. Fox News personality Sean Hannity asked if there was any evidence proving that it had actually happened, and Tea Party groups offered a cash reward for proof. Former Alaska Gov. Sarah Palin traveled to Harry Reid’s hometown—a speck in the Nevada desert called Searchlight—on Saturday to challenge the majority leader and rally the tea party faithful. “We’re sending a message to Washington,” Palin told the crowd of 10,000. “It’s loud and it’s clear, and in these upcoming elections we’re saying that the big-government, big-debt, Obama-Pelosi-Reid spending spree is over. You’re fired.” The event was the first stop on a tour, dubbed the Tea Party Express, which will travel the country until Tax Day on April 15. 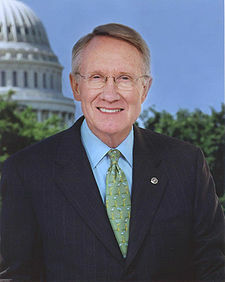 Reid is up for a tough election this November, and Republicans are eager for the speaker’s scalp. This week, Palin drew criticism for her aggressive language challenging the Democrats, coming at a time when members of Congress were under real threats of violence. Earlier in the day, Palin stumped for Sen. John McCain in Arizona. Mike Signer writes about the history of demagogues, and lessons the U.S. can learn from the post-Depression 1930s. A Marine’s call for peace. Once a Marine, always a Marine. Every service member has sworn an oath to support and defend the Constitution against all enemies, foreign and domestic. There’s no grey area to that. It’s as black and white as it gets. I nor any service member wants to combat civilians in this or any other country. I don’t know how many times I can reiterate that – we do not want it to happen. Even as we prepare for war, we pray for peace. We lace up our boots every morning in an attempt to preserve the freedoms that democracy has awarded us. We all love our country, and we would give our lives to protect it and its way of life. Military members must have faith in the system of Government, or the whole chain of command and system of military discipline falls apart. We are rarely given all of the details of our entire mission, and instead are expected to complete seemingly ambiguous tasks in support of that mission with the belief that we are doing the right thing . When we find an order illegal , we’re obligated not to follow it, and report it. So call me naive, but yes. I do have faith in the Constitution and the mechanisms inside of it to correct itself and removing people unworthy of holding office. If I didn’t, I never would’ve taken an oath to defend it. You just can’t defend part of the Constitution, or the parts you agree with. It’s all or nothing. I choose to defend all of it ,even the parts I may disagree with. Probably the most foolish choice of words I chose to use in that article were the words ‘civil war.’ I just shouldn’t have written them. But I could think of no other way to articulate what I felt it would require for the military to become involved. A civilian uprising wouldn’t be sufficient, it would require an all out civil war. Much of the comments reflected on this poor choice of words – and successfully derailed the conversation from a call for peace and to use the democratic system to resolve our differences, to people arguing over who’s side would destroy who. I’ll admit, I too was guilty in that regard – and my attempt to compare military and civilian life easily came across as boisterous and hostile, even though its’ intent was to be succinct and concise. For that, I apologize. BUT DON’T YOU @!$%#ING GET IT?!? In a war, no one wins. Even if you’re not wounded, it doesn’t mean you leave whole. The images, the feelings, the thoughts never leave you, they’re forever etched into your mind, and they become a part of who you are. It’s been said that “the people who die in war are the lucky ones – they don’t have to live with the memories of what transpired.” As morbid as it sounds, in many cases its true. And to what end ? What would be left AFTER this ‘war’ was concluded ? Would anything really change ? Or would we slowly sink back into the quagmire of the status quo, resort back to what’s comfortable, and then future generations will be arguing over the very reasoning behind this conflict , just as we now debate the real reason behind the civil war ? What would our children, and their children say when they look back at this point in our history ? Seriously, what does anyone expect to gain from fighting their friends, family, neighbors over a difference of opinion ? That’s what this really boils down to – people are screaming for blood because they feel differently than someone else. If that’s not the definition of madness, I don’t know what is. It needs to stop. Now. The senatorial elections are coming in November 2010. Everyone who feels passionately about this country , one way or the other, should get out and vote for who THEY think will best represent them . The same in November of 2012. This is your Constitutional right – this is your step in democracy. You get to choose who represents you and your views in the Government. If you choose to vote using force instead, not only will you fail in your attempt, but your cause will suffer on account of your actions. You will hurt not only yourself, but also every individual who ever aligns with that cause in the future. Consider that when you’re making your decision – our causes are not typically portrayed by our most noble or thoughtful members, but rather the most crude and thoughtless. They forever taint what might otherwise be a worthwhile message. So once again, I , an NCO of Marines, call on all people both military and civilian to exercise your Constitutional rights and participate in the democratic process. I urge you to stop reacting, and start instead thinking and considering. I urge you not to immediately dismiss opinions other than your own. I urge you to open your minds and consider that maybe, just maybe, there’s not a single one of us who has all of the answers, and that includes myself. In short, I urge all of you – to treat everyone else as you would want to be treated, whether you agree with them or not. Police estimate 8,000 at rally in protest of Democrats, health care overhaul.